Back in November, late one night as I lay in bed, I came to a rather sudden decision: it was time to close my beloved vintage shop. I opened Vintage Soup in early 2010. It was my creative outlet and my avenue for building a business that fit my aesthetics and adhered to my standards. And for six years, I have loved it. I've loved the combing through dusty thrift store shelves in search of vintage treasure. I've loved researching those found treasures and discovering their histories. I've loved photographing each item and writing up each item description. I've loved showing off the shop on social media and interacting with other like-minded vintage aficionados. I've loved the customer compliments and hearing how they appreciate the way I run my business. I've loved it all, and I could and did see myself doing this work for years to come. And yet for the past two years, the shop had only been marginally profitable, for reasons I tried to explain away to myself; I have young kids at home; I haven't had enough time to put into the shop, etc. However, as 2016 drew to a close, I started to take a serious look at my shop stats. Views from the year were way down from 2014 (my best year). Etsy has become saturated with vintage sellers since I started back in 2010. While this is mostly a good thing for buyers, as a seller, it has become very hard to get your items seen in a sea of other vintage items. 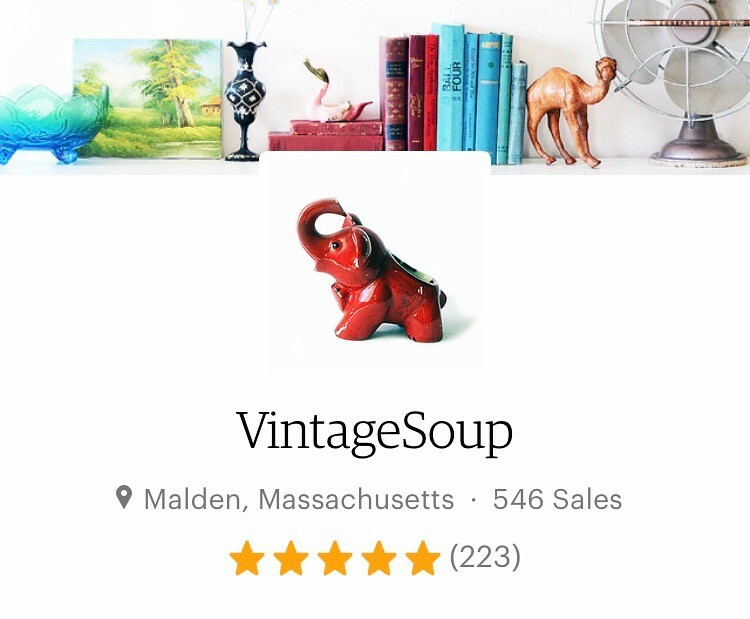 Plus, Etsy changed the search algorithm to reward sellers who are most active in their shops, and that's a great change. But I can't be one of those most active sellers. I have two little children who require the vast majority of my time and attention, and will continue to do so for a long time. When I started to really look at the hours I was spending on the shop and the income I was making, it was something like pennies per hour. I had always thought and hoped that once the kids were in school, I would have enough time during the day to make a decent financial contribution each month to our family, but I could see that was not going to happen for many years, if ever. And as much as I loved doing the shop work, it also caused me to feel a lot of guilt. Guilt if I didn't spend every free moment I had doing shop work; guilt when I didn't meet the number of new shop listings for the week that I had set for myself; guilt when I wasn't able to keep up with the social media aspects like I felt I needed to, and so on and so forth. Even worse, I found myself resenting my children. They need so much time and attention, and I was angry when their needs spilled over into what I considered shop needs. After I finally faced the possibility of letting VS go, I realized I had been split in two for who knows how long. I was trying to be a fully committed mother, wife, and family caregiver while at the same time trying to be a fully committed shop owner. I wasn't achieving any of those goals. That night in bed, I finally admitted to myself that I had been holding on to VS, and the dream of VS because I was scared. I was scared of being just a stay-at-home-mom in a society that doesn't value such work. I was afraid of losing myself and what made me interesting in the daily grind of caring for a family. I was afraid of others thinking I had wasted the excellent education provided me by Oglethorpe and Lehigh Universities. I was afraid of the moment when I would have to figure out what I was going to do once the kids were in school, of writing resumes after years of being out of the "workplace," scared of being stuck in entry level job when almost every friend I have has spent years building their career up. I'm still scared of all these things. For months now, God has been speaking to my heart about other plans he may have for me; plans about working in the foster care system, plans about working to help build understanding and respect among the major faith communities, plans to make a difference in people's every day lives. He has also been reminding me of some other true loves: work done in public history and cultural non-profits. I keep thinking of that bible verse where God says "For I know the plans I have for you, not to harm you, but to prosper you and give you a future." As soon as I had decided to let go of Vintage Soup and the dreams I had for it, I felt the lifting of a huge burden off my shoulders that I had not known was there. I don't know what my future "career" is going to look like and may not know for a long time. I'm working to be ok with the not knowing and with the fears I have about the future. I've asked God for two things; a career I can be passionate about and one that I can be proud of. And so I am going to sit back, take care of my family, fully committed, and wait for God's direction. If I've learned anything over the past thirty-three years, it is that God's plan for my life turns out to be, without fail, so much better than anything I could have come up with. If you are the praying type, please pray for me. And if you have been a customer of Vintage Soup, thank you so very much. You have given me an immense amount of pleasure and satisfaction these past six years. It has been a joy and an honor.